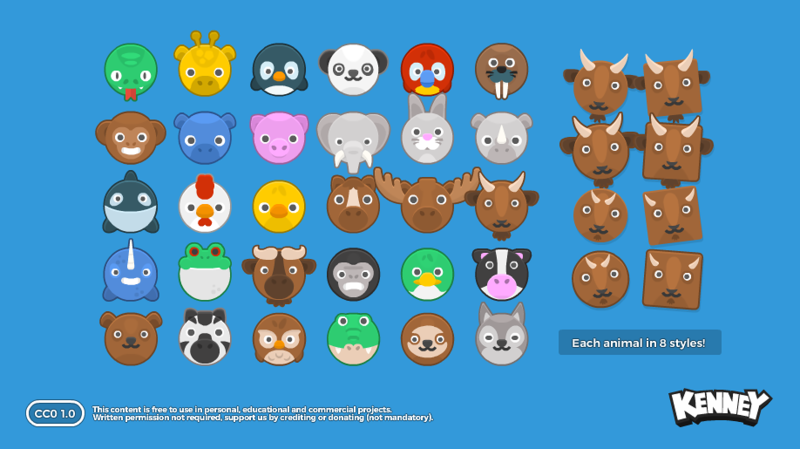 This updated version of the Animal Pack includes 30 animals each in 8 different styles (square/round, with/without outline, and with/without added detail). Bear, buffalo, chick, chicken, cow, crocodile, dog, duck, elephant, frog, giraffe, goat, gorilla, hippo, horse, monkey, moose, narwhal, owl, panda, parrot, penguin, pig, rabbit, rhino, sloth, snake, walrus, whale , and zebra. You may give credit to "Kenney.nl" or "www.kenney.nl", this is not mandatory but nonetheless appreciated. how can i request for a spritesheet? I really enjoy your art style, and intend to use it in my platformer game! May I request some 2D art? Italian themed if you could! Thank you so much.